Sober Look: Has China's Q3 GDP been grossly overstated? Has China's Q3 GDP been grossly overstated? Here is an interesting interview with Gordon Chang, who believes that China's GDP growth in Q3 has been grossly overstated. In his opinion the number should be closer to zero. His view is based on slow growth in electricity production across China as well as consistently weak PMI numbers. 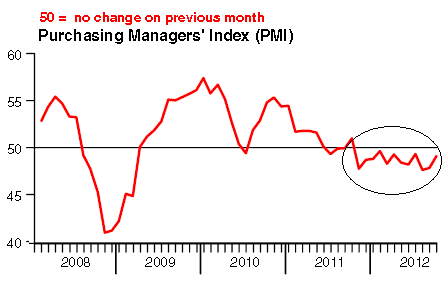 The HSBC PMI has been showing a mild contraction every month throughout 2012. He also points to an increasing risk of social unrest in China - which hasn't been covered by the media. This stems directly from the slowdown and the wealth inequalities that have developed in the country in recent years. YF: - Another area of concern for Chang is the potential for unrest. While the saga surrounding workers at the Foxconn factories where Apple gadgets are made has been well covered, Chang says it barely touches on what is happening on a broader scale.